Between taking the fast boat full of tourists and the overnight freighter full of Burmese workers to the Gulf Islands, the decision was easy. 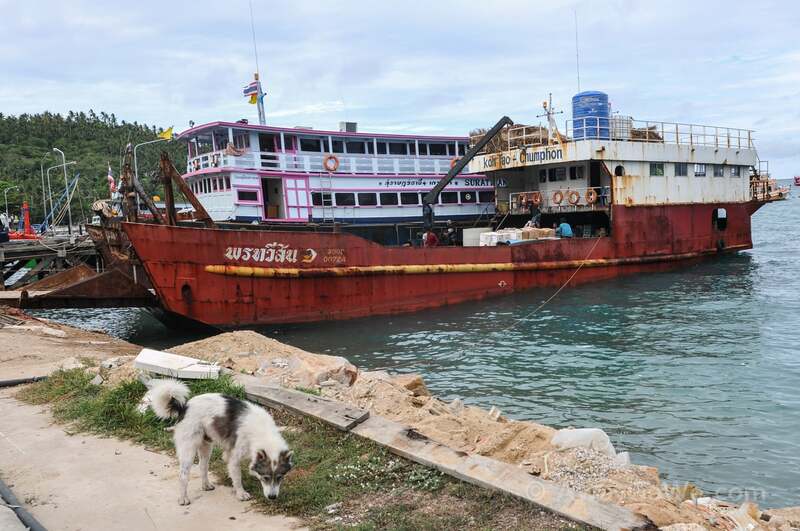 Our lovely rusting hulk of overnight accommodation docked at Mae Haad. Once the flocks of young farang (white foreigners) tire of Bangkok’s Khao San Road (perhaps a day or two or whenever the hangover wears off…) they typically head in one of two directions: North to emerse themselves in Chiang Mai’s “cultureness,” or South to the wicked beaches, bro. 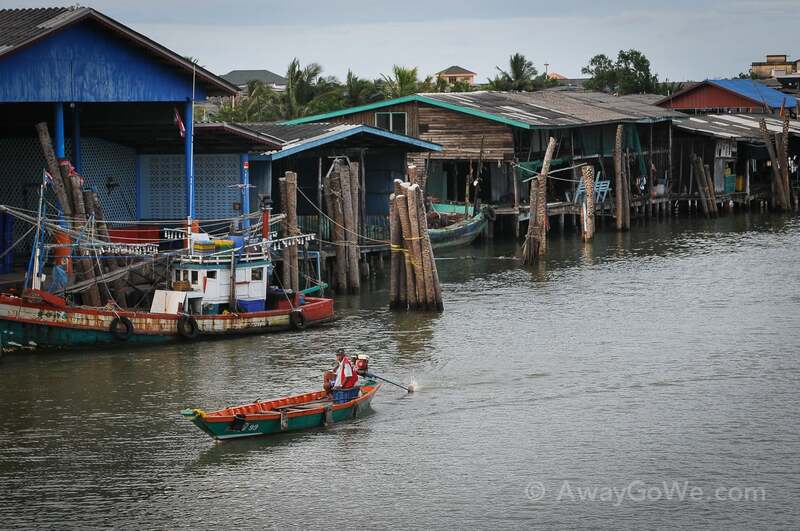 And indeed there aren’t too many different directions one CAN travel from Bangkok — point being that rarely do many tourists seem to stop anywhere in between and they most certainly do not veer from the well-trodden tourist trail. But why would they? — especially first-timers, given all there is to see along that well-worn yellow brick road. Perhaps one of the hardest things that I’ve had to get used to in Thailand is trodding the path together with hundreds of other foreigners. 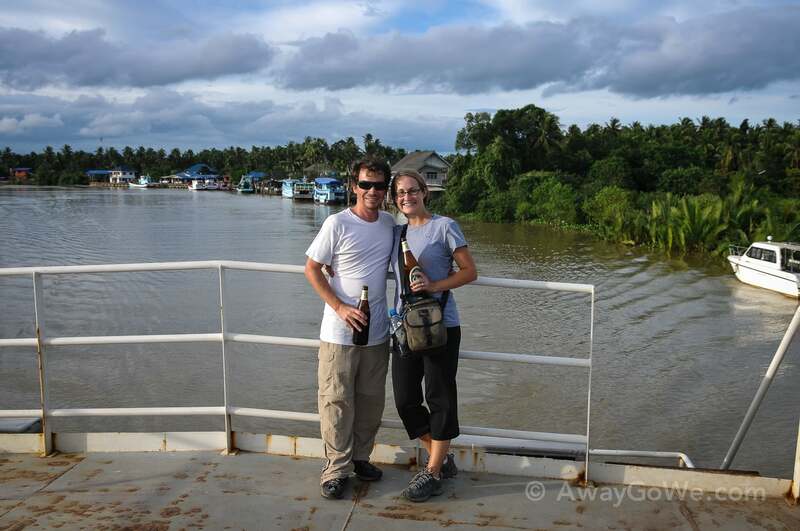 Certainly there are adventures off the path, but we came to see Thailand for what Thailand is known for back home: Its magnificent beaches and cultural sites — and to deviate from these things would have been a pity because there’s a reason all of those tourists come in droves. And yet, somehow, we still managed to find lesser trodden paths within a country which puts an incredible amount of effort into funneling backpackers down the straight and narrow banana pancake trail — and were ever so glad we did. 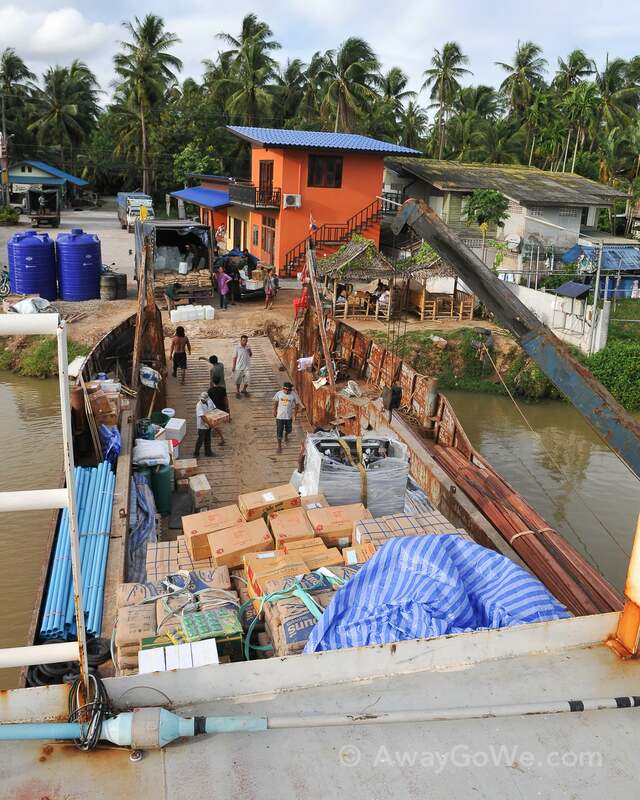 Burmese laborers loading the freighter prior to departure at Chumphon, Thailand (as viewed from the rear deck of our tiny slice of solitude and authenticity along the Thailand backpacker trail). It wasn’t a tough decision. Most backpackers bound for the Gulf Islands (namely Koh Tao, Phangan & Samui) buy a joint ticket from one of dozens of travel agencies in and around Khao San road that includes an 8-hour overnight bus to the island ferry pier followed by a couple of hours on a speed catamaran (Lompraya) or passenger ferry (Songserm). So it was only natural that we’d skip the travel agents and opt for putting the trip together ourselves. 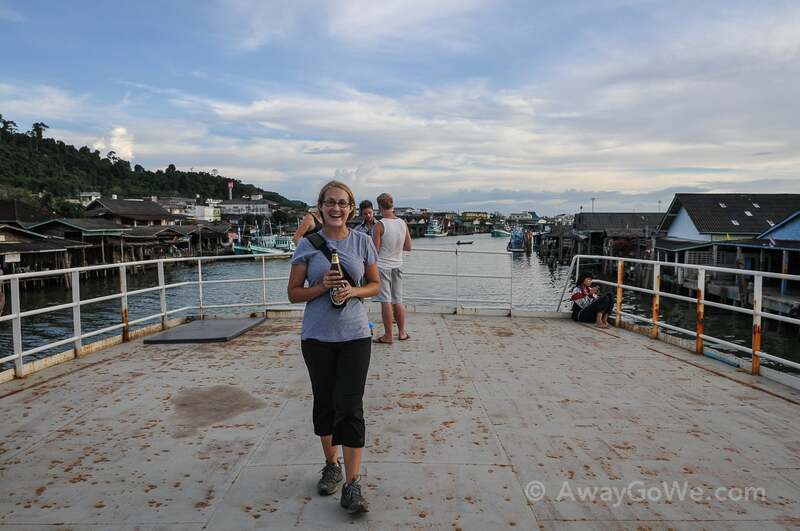 We opted for the day train from Bangkok to Chumphon — given our love of train travel — and had assumed we would take the Lompraya speed catamaran from Chumphon (due to the generally poor reviews of Songserm we had read online) but were never keen on the idea of spending more money than we had to. Luckily, we came across a third option: the overnight slow boat — and we were instantly sold. 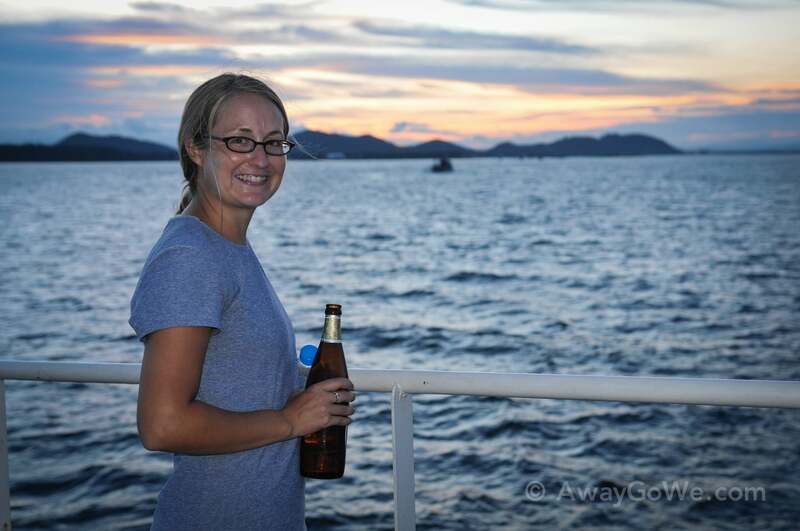 Lori, topside, getting ready to pop open a couple of cold ones with the three other farang onboard to mark our departure from Chumphon. The aft deck, where we spent the majority of our waking hours. 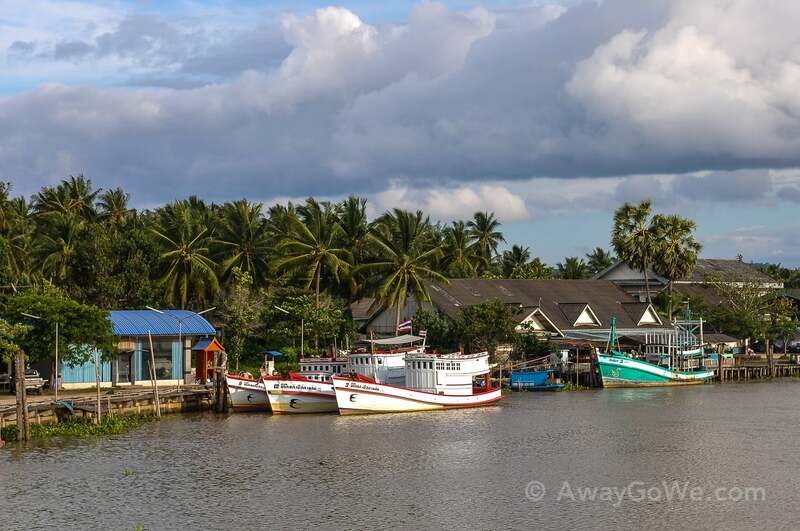 It’s 5 o’clock somewhere — in CHUMPHON! After leaving the train station in Chumphon (which is conveniently located in the middle of town), we made our way to the TAT (Tourism Authority of Thailand) office to inquire about purchasing slow boat tickets. 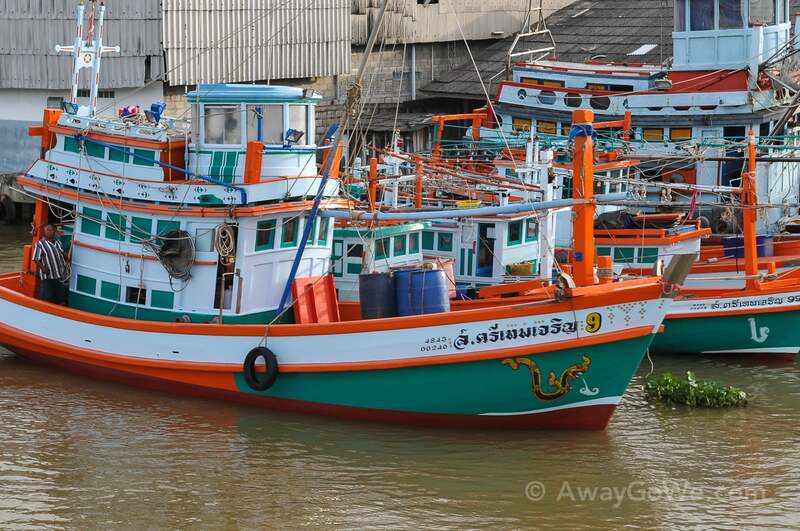 TAT sent us over to Fame Tours, which is apparently the primary ferry ticket seller in Chumphon. I’m certain we probably could have bypassed the agency somehow but it would have been very difficult given that the cargo pier was a good 10-15 minute drive outside of town. 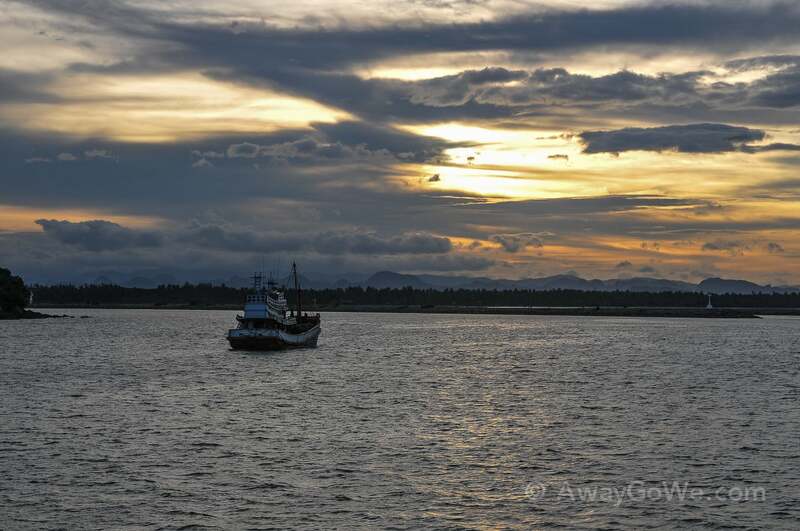 View from the upper deck :: Motoring slowly down the river and out to sea after leaving Chumphon. 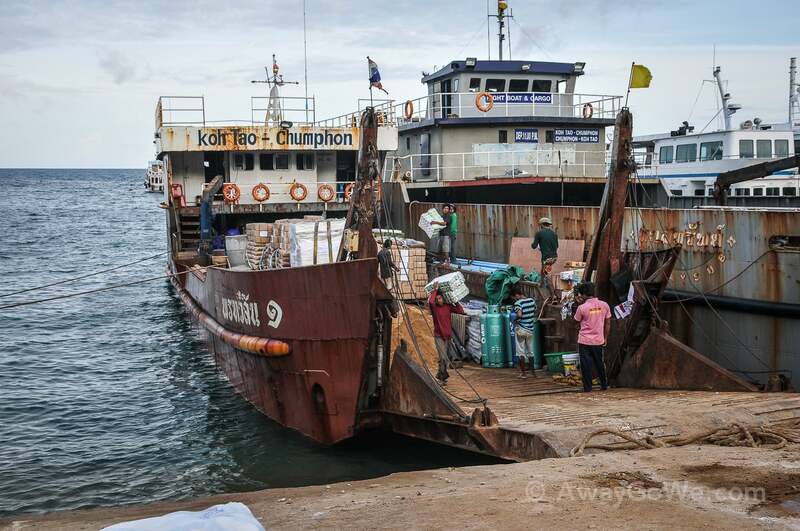 Normally, there are two overnight boats available from Chumphon to Koh Tao — a car ferry and a cargo freighter. Despite what others have said in the past, both options now appear to have bunks available. 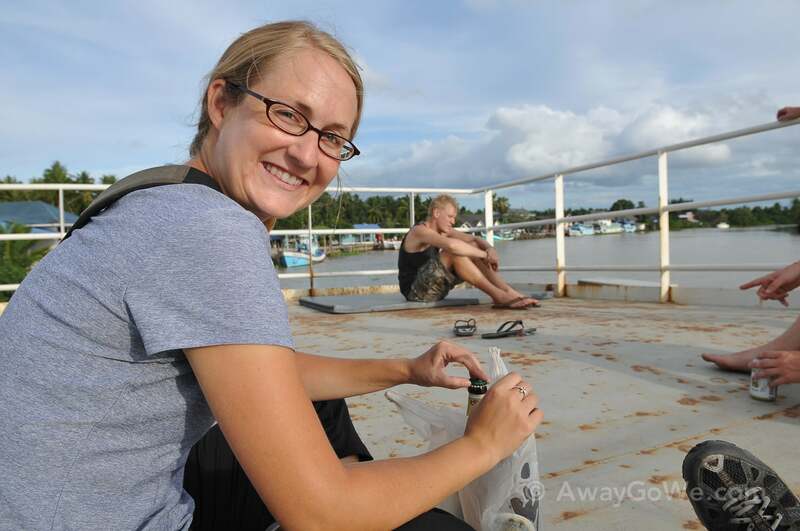 From what we’ve heard, in the past the only option on the cargo boat was to sleep on the deck under the stars (not a bad-sounding prospect, but potentially risky in the rainy season as one might expect). 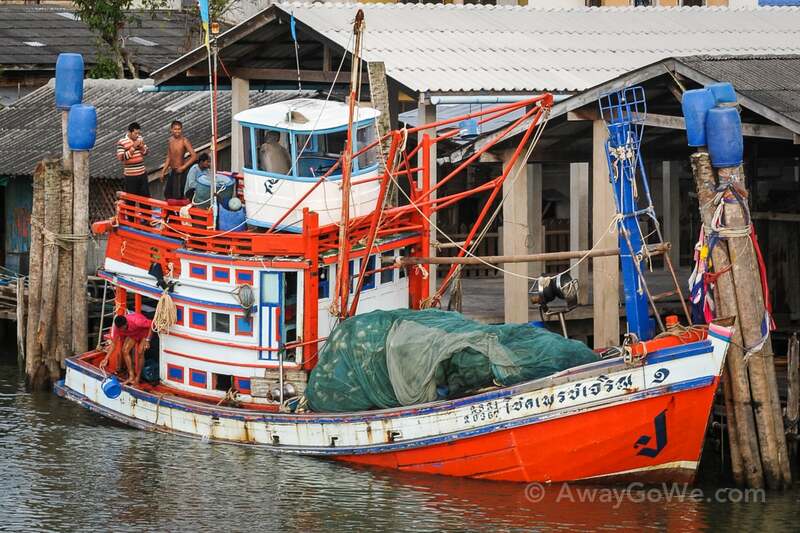 The boats generally depart from Chumphon before or around midnight and arrive in Koh Tao (Mae Haad) around 5-6am. Our train from Bangkok got us in to Chumphon around 2:30p and we initially anticipated a long wait, hold up in some wifi cafe killing time til midnight. 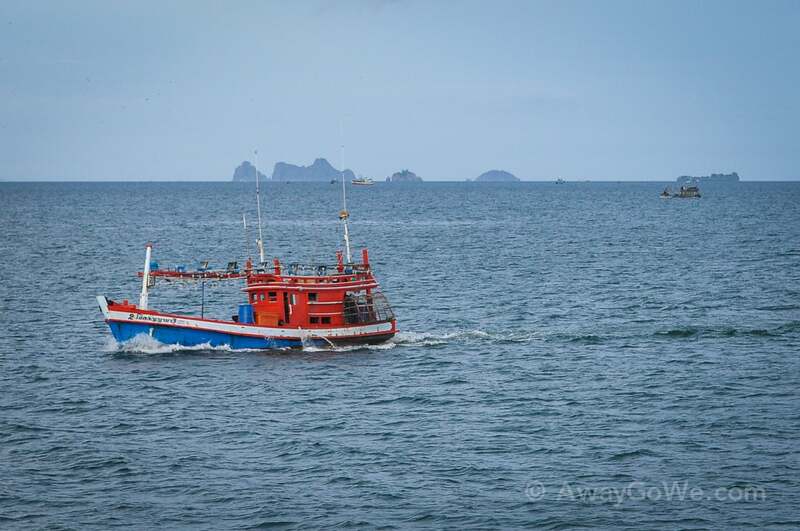 However, this time of year and/or month (we made the trip in late September) the overnight cargo boat and car ferry were temporarily departing at 5p and 6p, respectively, due to the tides. That got us into port around midnight. However, the bunks were ours for as long as we wanted them until the boat returned to Chumphon the next evening (though most of the backpackers left before 9am). 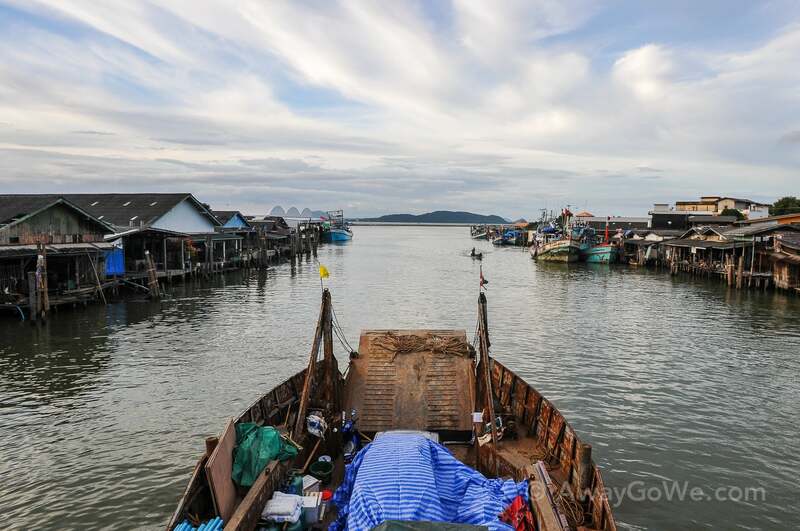 Getting on the boat was a bit interesting as well with our heavy packs, as we had to clammer over cargo, up small rusty steps and over rebar and a bundle of 2x4s to reach the cabin toward the aft/rear of the vessel. The crazy Welsh guy who seems to oversee some portion of the operation quipped that it gave a new meaning to “walking the plank.” He also half-jokingly mentioned that if we happened to fall off the boat while it was underway, we’d pretty much be on our own. Not your typical tourist operation indeed — and we couldn’t be happier. Our overnight accommodation :: bunks in the main cabin of the freighter. Sailing conditions were favorable for most of the journey. The first stretch followed the river from the slow boat pier (about 7km outside of Chumphon) past a number of fishing villages where dozens of colorful wooden shrimp and fishing vessels sat docked along the waterway — the evening light seemed to electrify the bright green and orange paint and I couldn’t help but think we’d be in heaven if only we were Miami Hurricanes fans or Irish for that matter, though we found the scenery quite agreeable nonetheless. After about 20-30 minutes, we passed the jetty on a northeast heading out to sea, slowly motoring by a collection of picturesque islands jutting out of the deep blue. We followed the sea lane for another 30 minutes before making a hard turn starboard in the direction of Koh Tao somewhere to the southeast. Ahead, the Gulf of Thailand. Locals enjoying a cool evening on a pier near the jetty. 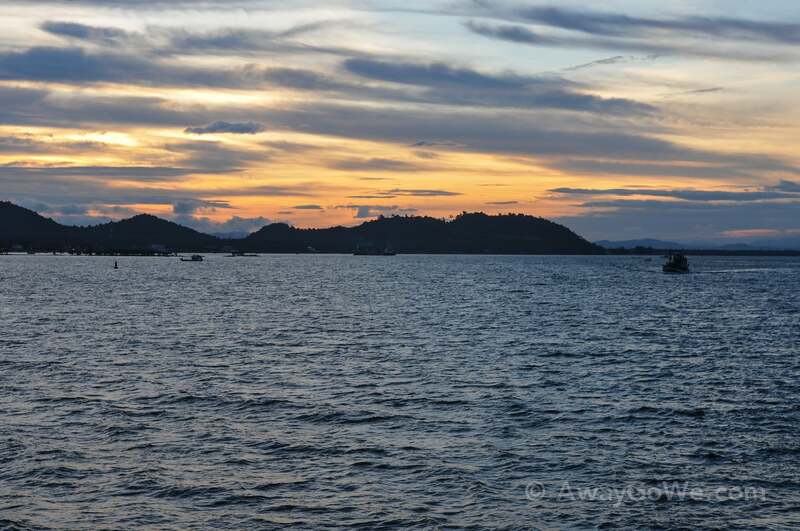 The Gulf of Thailand :: Next stop, Koh Tao! The night was warm with a nice breeze from the movement of the ferry. 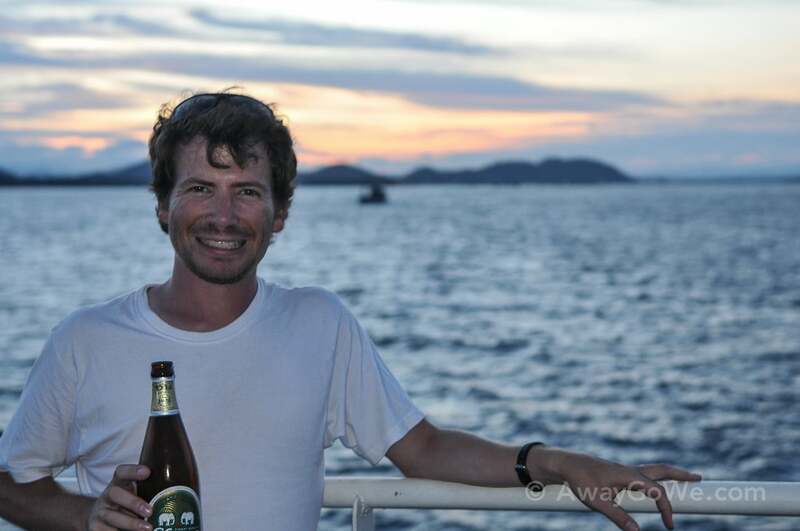 We were treated to a gorgeous sunset over the mainland, as well as traveler’s standards played and sung by one of the other backpackers aboard as we slowly sipped our Chang beers. 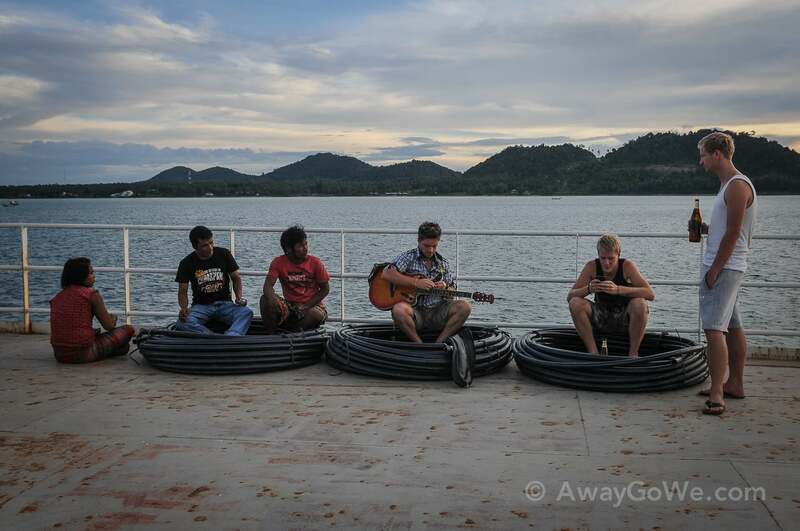 A few of the other passengers on board including the other three farang backpackers. 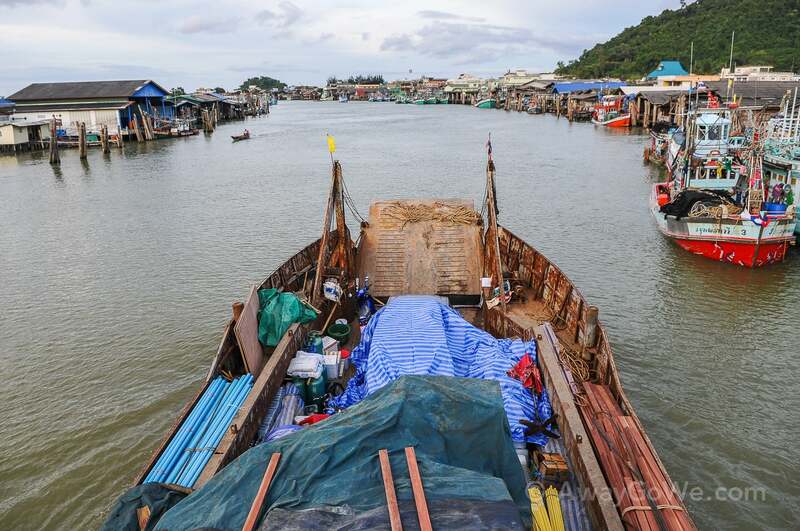 There were no more than 10 passengers aboard including the Burmese workers — a stark contrast to our future ferry trips amongst the islands which would involve heaps of tourists. The sun set between 6:30 and 7p, followed by a brief period in which a dark sky was awash with bright stars. However, a nearly full moon quickly crept up, blowing out the sky but casting light over the black ocean. We motored along following the brightly lit green buoys which led out to the horizon. Every so often, we’d pass an anchored fishing vessel rocking frantically from bow to stern, brilliantly lit by hundreds of fluorescent lightbulbs. Looking out in any direction we could see a few of these at almost any given time. Looking farther beyond the busy boats and sea lane buoys we could also see we were turned directly into a fearsome looking collection of very active thunderheads, as we watched frequent bolts of lightning illuminate a tiny distant speck. 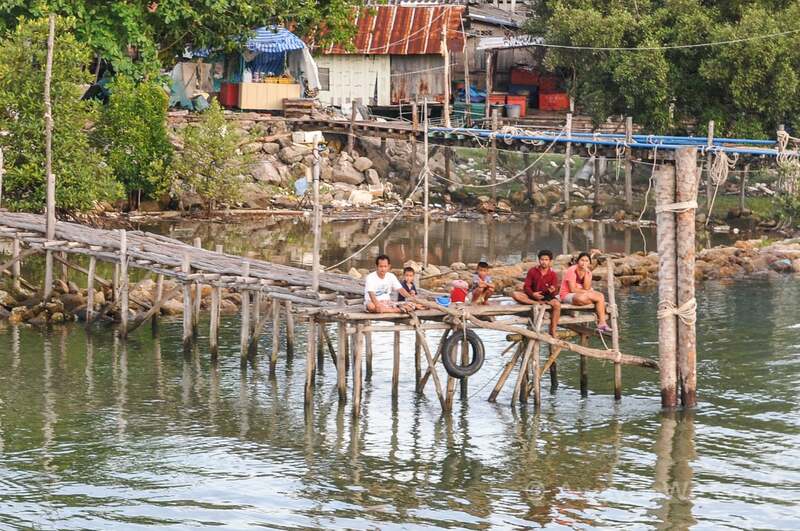 We hoped it wasn’t Koh Tao — our destination — but would find out soon enough. By 9p, the top deck had become too breezy for comfort and the vessel had begun to rock just enough to make walking about an adventure. Most of the crew had retired to their bunks and we did the same. Some time around 10:30p, I awoke to the vessel rocking significantly from side to side. My assumption was that we were close to the storm and wondered how long it would last, given that the Welsh guy at the pier told us we’d arrive around 1am. Could we still be that far away? The seas grew rougher over the next 20 minutes — which, despite preventing sleep, were oddly relaxing and not the least bit sickening. Then, suddenly, the swaying completely stopped and the roaring engine went idle. We were coasting on placid waters. I looked at my watch — 11pm. Where were we? What happened to the storm? Then, just as quickly, the engine revved up again as the bow slowly nudged its way up on a bank of mud. I stumbled out of my bunk and out to the rear deck. 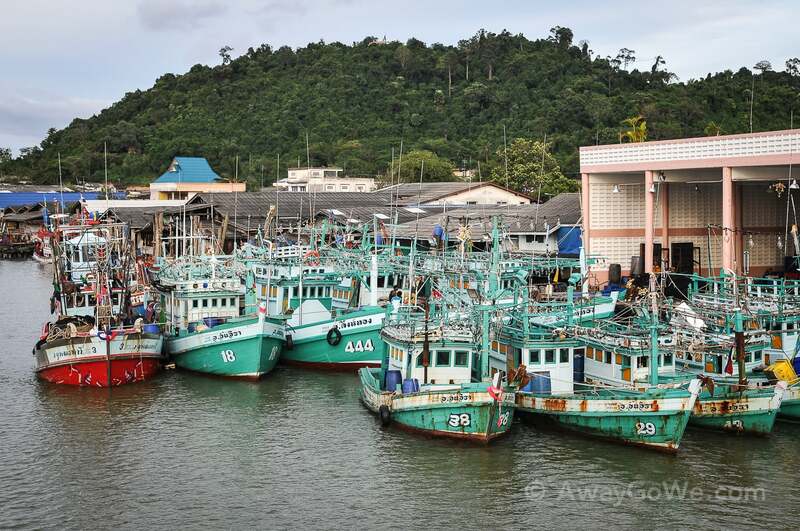 There were about a dozen fishing boats moored just beyond the stern of the boat, bobbing in deep aqua blue. 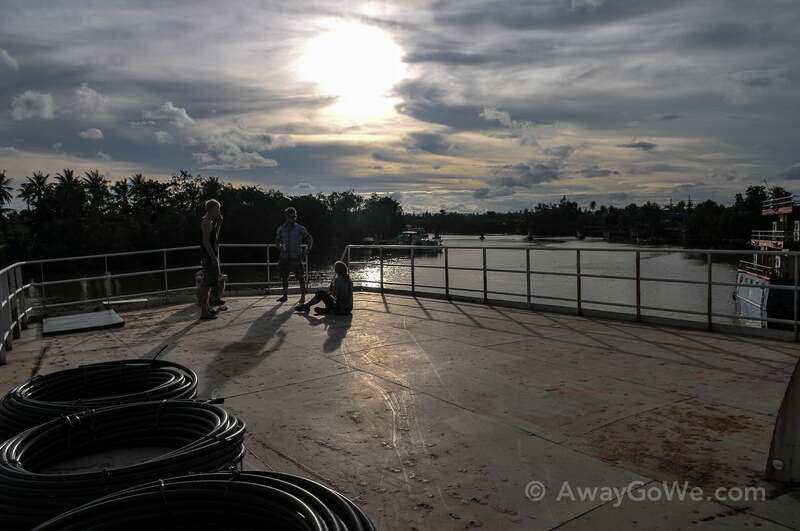 I turned around and walked the length of the freighter through the front hatch and looked up at the glowing white sign which read “Koh Tao Resort.” We had arrived. The journey took just under 6 hours to travel some 50 nautical miles. Satisfied at this new development, I returned to my bunk and fell fast asleep. Lori and I awoke around 7a, gathered our packs and proceeded to cover the final one mile of our journey on foot to Big Blue Diving in Sairee Village. Our abode for the night, safely harbored in Mae Haad, Koh Tao.